Heather is a Managing Partner and Director of our Reading and Ipswich Clinics. Heather received her Bachelor of Science degree from Salem State University in Education and her Doctorate of Physical Therapy from University of Massachusetts Lowell. Heather’s additional certifications include Strength and Conditioning Specialist (CSCS) and Titleist Performance Institute (TPI) Level 1 Medical and Fitness Professional. Heather is licensed in the state of Massachusetts as a Physical Therapist and is an active member of the APTA. 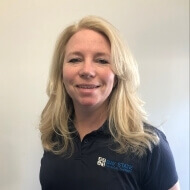 As a physical therapist, Heather enjoys treating patients of all ages and orthopedic conditions; Helping patients to either avoid surgery, to strengthen pre-surgically, or to return to their highest functional level. Heather’s treatment style includes manual hands on techniques, strengthening exercises, neuromuscular re-education and functional activities proven effective in the clinic as well as in research. She also believes each treatment session needs to be tailored to the individual. Heather was inspired to become a therapist after sustaining a knee injury from sport and was unable to continue to compete. It was her first experience with injury as well as physical therapy and she was grateful for the skill, expertise, and emotional support her therapist gave her. This experience and others has shaped who Heather strives to be as a therapist; She is part of your team, working hard with you to reach your individual goals. In her free time, Heather enjoys family time with her husband and four children. She is active in the gym, and playing golf, biking and walking and enjoys traveling.